Since 1998 we’ve managed over 150 M2M implementations and post-implementation projects. Make no mistake, the quality of your implementation is largely tied to the expertise of your implementer and the capability of your on site project manager. The decisions that are made during the implementation process have long lasting implications on the effectiveness of your ERP system use. And, how much you can actually get done during that upfront implementation phase depends on how quickly effective solutions can be defined and cost effectively implemented when you encounter those functionality stumbling blocks during your pilot. Now this isn’t really big news to anyone implementing an ERP system. Most senior managers have done their due diligence and have been presented with plenty of information on ERP implementation pitfalls. 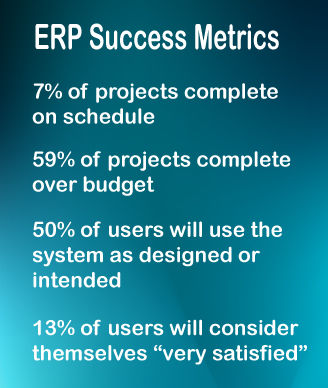 Yet even with that, the ERP system implementation ‘success rate’ is horrific. 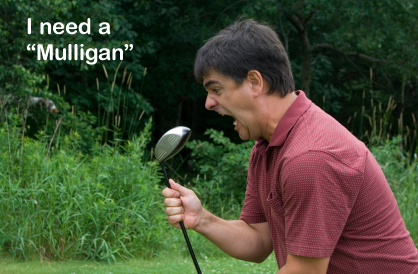 We see it everyday as we work with new clients struggling with partially implemented or poorly implemented systems. But to put a number on it, I did a bit of industry research. So how bad is it? Implementation under sold up front. A commonly acceptable minimum ratio between software and implementation cost is 1:1, and this can easily go to 1:2 if you are implementing peripheral functionality like Advanced Planning and Scheduling or Factory Floor Data Collection. Implementation Consultant is inexperienced or simply not that good. This is a big driver for cost overruns. The consultant is on the clock and burning through your implementation budget. How fast he or she can dissect a problem, define, and implement a solution is key. What happens here is that we eat up the implementation budget and end up with a partially installed system, or at best, a system with just basic vanilla functionality. Ineffective on site project management. Implementing an ERP system takes a ton of customer supplied resource and a solid customer on site project manager to ensure all the the things that need doing between consultant sessions are being done. Without a good plan and solid on site management of that plan the schedule invariably slips until top management steps in and forces the implementation regardless of outstanding issues. We go in with less than desirable and inefficient problem workarounds or worse. Once we have ‘gone live’, and the consultant budget has been spent, it is generally a long time before management is willing to throw any money at a new system they just implemented. So we struggle along, develop work-around’s, use just a portion of system functionality, and are just plain inefficient in our system use. Can we get a ‘do over’? The good news is no company needs a total ‘do over’. What you do need is to re-model your system use process with an expert. Call it Re-Implementation, business process analysis, or Post-Implementation review. Whatever you call it, it involves running through your business processes as relates to system use and identifying that ‘low hanging fruit’ where a change in process or minor system tailoring affords a sizable and immediate payback. Industry experts agree; The majority of the anticipated payback in any ERP system project is realized as a result of a Post-Implementation review and ‘system tuning’ that will occur as a result of this process. Now armed with months, or sometimes years of system use experience, a company will be much better positioned to work through issues that were set aside during the initial implementation. Make no mistake! Done right, a well run Post-Implementation process has substantial payback. In my next article we’ll dig into the details of Post Implementation Review.